The Paris revolution of February 1848 raised unrealistic expectations in famine-ravaged Ireland. The sudden collapse of established regimes across Europe gave new hope to a divided and dispirited Repeal movement. Irish nationalists were led to believe that the Union could be repealed with similar ease. The romantic nationalists of Young Ireland were particularly heartened by events in France, where Louis Philippe was overthrown in an almost bloodless revolution and a poet, Alphonse de Lamartine, installed as head of the provisional government of the Second Republic. The Nation became almost as inflammatory as the United Irishman, which John Mitchel had launched after a split with Charles Gavan Duffy. In Dublin, Lord Clarendon’s anxiety increased. The ‘lower orders’ were excited, the Lord Lieutenant reported to the Prime Minister, Lord John Russell, ‘and say now that the French have got their liberties, they will come and help us to get repale [sic]’. It quickly became clear, however, that the French Republic, valuing good relations with Britain, would not openly support Irish nationalism. In April, a Young Ireland delegation led by William Smith O’Brien and Thomas Francis Meagher presented a fraternal address to Lamartine; his reply was non-commital. While the delegation was in France, John Blake Dillon outlined policy to Confederates in Tipperary from his sick bed. To exploit the present opportunity it was necessary to heal the divisions between Old and Young Ireland, and thus regain the support of the predominantly O’Connellite clergy. (The Young Irelanders had formed the Irish Confederation after leaving O’Connell’s Repeal Association.) Let the summer be spent organising a national council and a national guard, Dillon argued, and by September they would be able to say—‘an Irish parliament or else’. Significantly, as the Paris revolution degenerated into the bloodstained ‘June days’, culminating in the shooting of Archbishop Denis Affré at a barricade, the militant section of the Irish clergy drew back. Mitchel was the first to be silenced under the new Treason Felony Act. His conviction by a packed jury and the severity of his sentence—fourteen years transportation—had a catalytic effect. It aroused widespread indignation and helped to close the ranks of the Repeal movement. Mitchel hoped his fate would precipitate a rescue attempt by the Dublin Confederate clubs, and thus ignite the country. After his deportation representatives of the Young Ireland factions met secretly to plan for an uprising for September. William Smith O’Brien (seated) and Thomas Francis Meagher under guard while under sentence of death. But the British government suspended the Habeas Corpus Act on 22 July after reports of a demonstration on Slievenamon, County Tipperary, attended by 50,000 people and addressed by Meagher and Michael Doheny. A poster announcing the meeting said its purpose was to demonstrate to the government their determination to obtain Repeal by constitutional means, ‘if possible’. The few leaders available in Dublin met hurridly in 9 D’Olier Street to consider their options: arrest, flight or insurrection. Honour, in view of Young Ireland rhetoric, demanded a principled stand. Dillon and Meagher took the stage coach to County Wexford, where O’Brien was staying and persuaded him to lead the rising. The reluctant leaders had made hardly any preparations and drifted halfheartedly towards rebellion. In Kilkenny, Dillon offered to attempt to capture the garrison if 500 armed men would follow him, but only fifty could be found. When that scheme was abandoned the leaders set off to test opinion in the neighbouring towns. 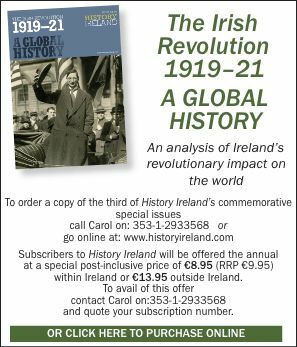 A torrent of humanity greeted them in Carrick-on-Suir; ‘it was the revolution if we had accepted it’, Meagher wrote later. This was the defining moment of ‘48. As to why they did not act, Patrick O’Donohue thought Meagher sensed defeat and great loss of life, and his humanity urged him not to risk the shedding of innocent blood. Mitchel would later remark in his Jail Journal that the leaders were ‘good and brave men but not sufficiently desperate’. According to one of the Mullinahone constables, after the chapel bell was rung O’Brien told a crowd of 200 that a warrant had been issued for his arrest. If it was not the wish of the people that he should surrender, ‘he would resist any attempt to arrest him’. Accordingly, at least 2,000 men entered the village armed with pikes, pitchforks and guns. But the crowds melted away before clerical admonition and O’Brien’s failure to feed his ragged army. The indecision of the rebels’ leaders contrasted with the determination of the British state. Eventually, the intervention of the Catholic clergy, fearful of repression on a scale with 1798, probably averted a massacre. When the dejected leaders met in The Commons, above Ballingarry, Dillon proposed that they fall back on Kilkenny, fortify a large house and issue a proclamation. On this plan being rejected he left Tipperary for the west, thereby missing the inglorious encounter with armed police at the Widow McCormack’s house which ended the rising on 29 July. In retrospect, O’Brien admitted to having ‘totally miscalculated the energies of the Irish people’. As revolution, the rising was a pathetic farce; as revolutionary theatre, however, it was a gesture against death and despair, evictions and emigration. Its political effects were profound and far-reaching. Although some of these were slow to mature, others manifested themselves quickly. It re-established republican links to the United Irishmen; James Fintan Lalor and Mitchel brought the issue of landownership into the political arena; after his acquittal, Duffy revived The Nation and laid the basis for tenant right agitation. Moreover, the dispersal of the Young Irelanders gave them authority to interpret emigration as exile. Many, including Dillon and Doheny, evaded capture and escaped to the United States. Four of the leaders, O’Brien, Meagher, Terence Bellew MacManus and O’Donohue, were captured, sentenced to death but eventually transported. They joined Mitchel and others in Van Diemen’s Land. Appropriately, half the country was festooned with French flags during Le Tour in July 1998. The Irish Tricolour, which aspires to reconciling Orange and Green, is 150 years old this year. It was brought from Paris by the Young Irelanders in 1848 and presented to the Irish people as a symbol of ‘new life’. Brendan Ó Cathaoir is a historian and journalist with the Irish Times. J.S. Donnelly, jnr, ‘A Famine in Irish Politics’ in W.E. Vaughan (ed. ), A New History of Ireland, V (Oxford 1989). B. Ó Cathaoir, John Blake Dillon, Young Irelander (Dublin 1990).